The Ballroom is located next to the classrooms. All the ambiance of “Old School” charm is matched with state of the art facilities. The Ballroom is a unique venue boasting a stage for performances and speakers, handicap bathrooms, exquisite lighting, a romantic balcony and two screens for video presentation. Atmosphere/Decor: The Ballroom is a unique venue boasting a stage for performances and speakers, handicap bathrooms, exquisite lighting, a romantic balcony and two screens for video presentation. A large open space suitable for cocktail parties, wine tastings, and all types of ceremonies. Easily accessible from many of our indoor event spaces making it easy to transition your group. This space can go casual or elegant. String lights create a festive atmosphere in the evenings while the surrounding trees provide a lush backdrop. Space heaters extend the seasons. As the main theme of an event or for a fun activity as part of a larger agenda, we offer an 8-hole miniature golf course and disc golf in the play field. We can easily set up food and bar service in the vicinity to increase your guests’ enjoyment. The picturesque backdrop of the water wheel slowly turning in the Mill Pond is a lovely venue to smaller ceremonies. The large, multi-use field has hosted everything from car shows to major wine events such as the Oregon Wine Experience to kickball tournaments and cyclocross events. Hops vines grow on one end and grape vines on the other, along with a vegetable garden and hen house to the side. So it is open to your imagination – athletic competitions or refined garden party. We can arrange for canopies and tents as needed. The star of the field is Engine #1 – Jacksonville’s original steam engine. It sits on its original tracks on the original right-of-way. A great backdrop for group photos. The Large Group Room is located next to the Ballroom. Our most versatile room, the music room has plenty of chalkboard space for your instructor to work. This space is perfect for presentations, Bridal showers and lectures. It also has direct access to the beautiful Biergarten/patio. Atmosphere/Decor: The large group room has plenty of chalkboard space for your instructor to work. This space is perfect for presentations, Bridal showers and lectures. It also has direct access to the beautiful Biergarten/patio. The AV Room is located in the Old Schoolhouse on the First floor off main lobby. By far our most modern room. Equipped with state of the art electronics including a projector and built in screen, wi-fi, surround sound, telephone conferencing, as well as a kitchenette. Ideal for that big presentation, vacation slide show or board meeting, or company party. Atmosphere/Decor: Equipped with state of the art electronics including a projector and built in screen, wi-fi, surround sound, telephone conferencing, as well as a kitchenette. Ideal for that big presentation, vacation slide show or board meeting, or company party. The Larry Smith Room is located adjacent to the Ballroom. Named for one of the Old School’s most devoted teacher. Mr. Smith taught 5th and 6th grade in this room for 17 years. From 1966 – 1983. Mr. Smith taught at Jacksonville School for a total of 33 years. This room offers a view of the front courtyard and was renovated to showcase original walls, chalkboards, dry erase, and flooring. Perfect for small group meetings and dance classes. Atmosphere/Decor: This room offers a view of the front courtyard and was renovated to showcase original walls, chalkboards, dry erase, and flooring. Perfect for small group meetings and dance classes. The Library is located in the Old Schoolhouse on the first floor off main lobby. Our quietest and most secluded room. Surround yourself with collegiate charm. Shelves filled with old text books, study tables, a cozy seating area, kitchenette and even a poker table. The library is the perfect room for your next small business meeting, poetry reading or poker night. Atmosphere/Decor: Surround yourself with collegiate charm. Shelves filled with old text books, study tables, a cozy seating area, kitchenette and even a poker table. The library is the perfect room for your next small business meeting, poetry reading or poker night. Many functions include children and our play ground is a great venue to keep them entertained. Or it can play a key role in events for the younger set. Adjacent to the miniature golf course and mill pond and shaded by 100 year old oak trees. A sunken garden area that offers a beautifully intimate setting for small ceremonies and receptions. Boxwood shrubs provide year-round appeal which is supplemented with impatiens and other annual for seasonal color. Named in memoriam of a former student of Cascade Christian Academy. 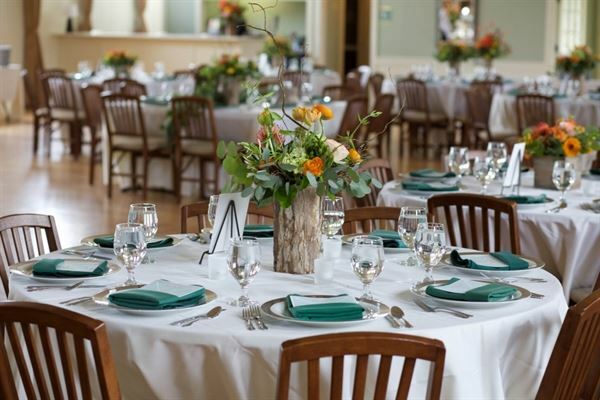 Special Features: Nestled in the heart of Southern Oregon Wine Country, our beautiful historic 1908 Schoolhouse is the idyllic location for all of life’s celebrations. The perfect location for weddings, reunions, corporate retreats or any special occasion.